Hey guys and Happy Hump Day! I started off the day with an awesome Balanced Athlete Class at Empowered Yoga and then hit the grocery store to pick up a couple things since I hadn’t been since last week. 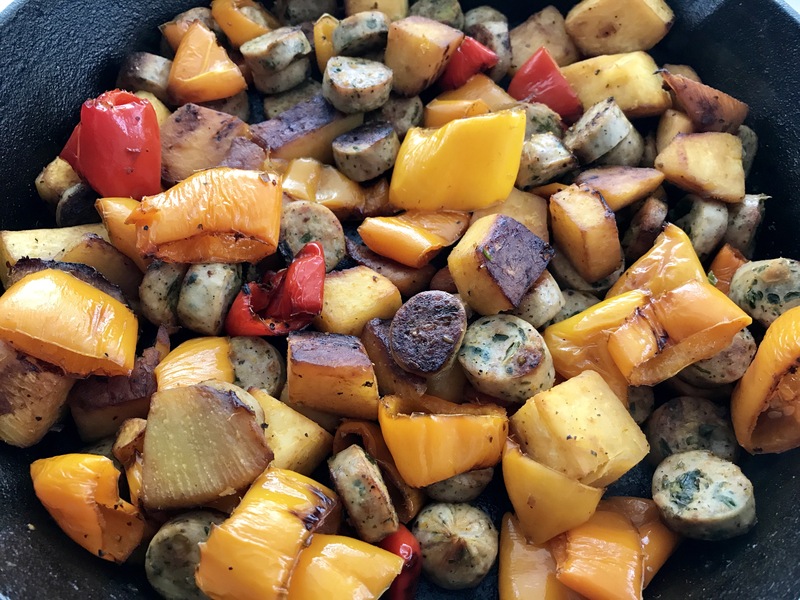 Once I got home, I got right in the kitchen and did some meal prep for the day and I wanted to share a simple lunch/dinner recipe with you that we absolutely love! I was able to prep lunch for Brian and I at the same time I was cooking all of us breakfast, so by 8:30 AM, I felt like a freaking BOSS! I’ve said this before and I’ll say it again, “I am not a good cook”. In addition to not being the best cook, I don’t have much time to be in the kitchen. I probably make more time than most people my age, but since having Delaney and my crazy all over the place work schedule, I am not left with much time – especially in the evenings to cook up a meal. And dishes. Don’t even get me started on dishes. I rather scrub a toilet with a toothbrush. So for me, most of my friends, family and clients, quick and simple meals are the name of the game these days. Quick and simple meals that are also nutritious is also of upmost importance and I promise you..it can be done. Chicken sausage are a staple around our house. I always have it in the refrigerator for quick meals on the fly. Breakfast, lunch or dinner – it works anytime of day. 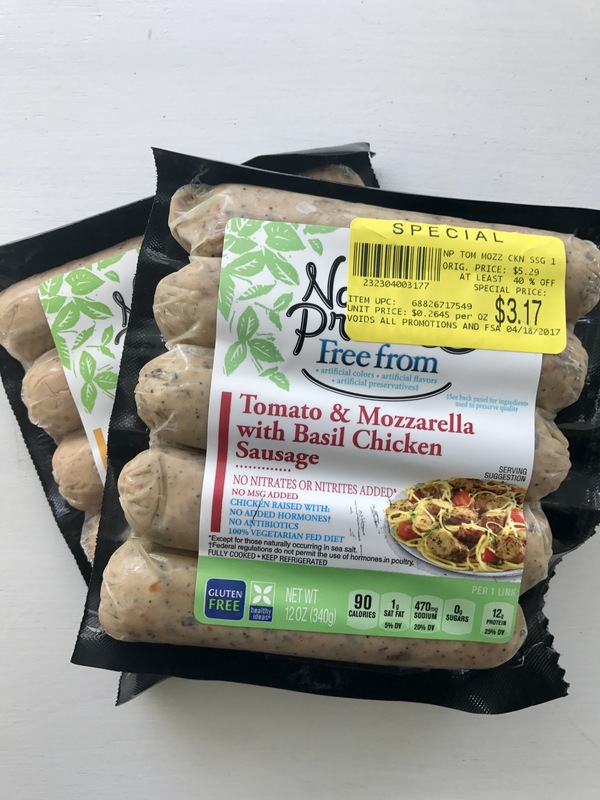 Typically, I just grab a few at a time at Trader Joe’s or Balinski brand found at Whole Foods, but this week I found Organic Nature’s Promise on sale ($3.17) at our Giant…so I scooped up a bunch of different flavors! What’s great is that there is no real recipe, more just the method. So whatever veggies you have on hand or that you prefer can work! Last night I made a classic version with peppers, onions, zucchini and roasted garlic chicken sausage served over brown rice. 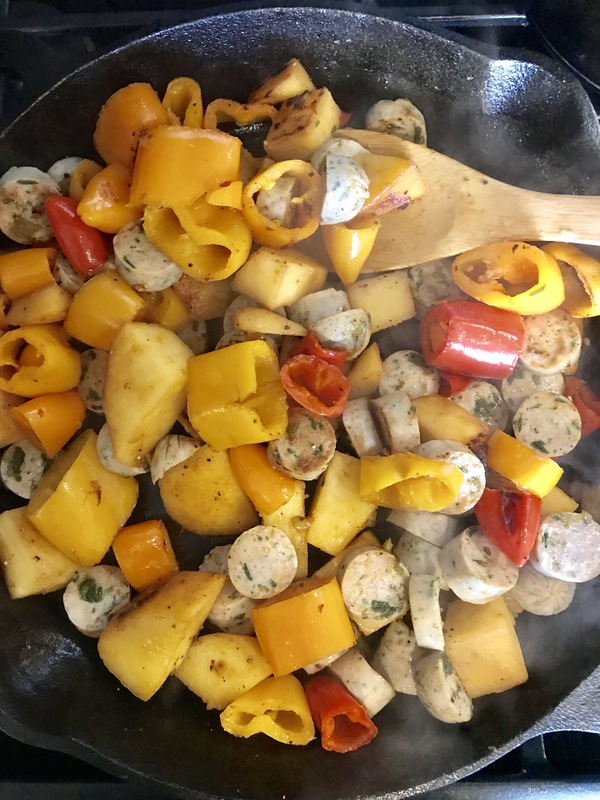 This morning used more bell peppers, turnips and kale fontina chicken sausage. I will serve this one over top massaged or sautéed kale! Other options could easily be brussels sprouts, broccoli, cauliflower, sweet potatoes, parsnips, squash and then serving it with rice, quinoa or pasta. Whatever your little heart desires! 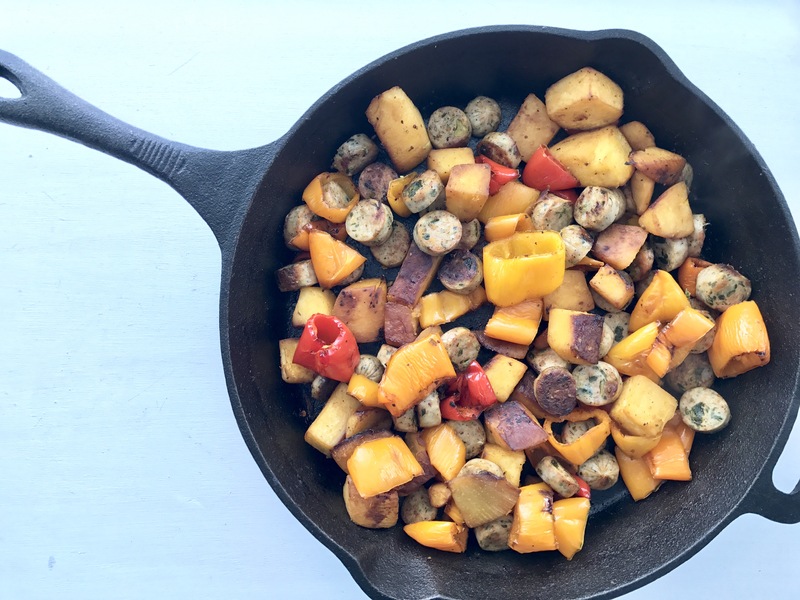 I use a cast iron skillet, because not only does it not release toxic chemicals when heated, it also gets things nice and crispy and can transfer right into the oven! To start, heat oven to 375 degree. Then I just heated about 2 tbsp avocado oil in cast iron skillet over medium heat, then tossed in the parsnips and onions. Let them cook down for a bit, then added the the peppers – stirring occasionally for about 6-8 minutes. Tossed in sliced chicken sausage, cooked for another 4 minutes, then tossed it into the oven and cooked for 35-40 minutes. Everything is pretty much already cooked, so it just depends on how “roasty” you want the veggies. Technically, if you’re short on time, once the chicken sausage is heated through, you could eat it then! Remove from over and serve over top brown rice, sautéed spinach/kale, chicken pea or whole wheat pasta, quinoa, cauliflower rice, etc. See! You can’t mess this one up!